The opportunity for us to receive the highest level of Full Light Body, 24 Strand DNA Activation to become the Adam Kadmon wasn’t available until 1998. Since then, thousands of people have been activated at this level. They are beginning to experience the transformational shifts that will eventually bring them into a fully Divine Human state on Earth! With the prophesied end of humanity as we know it and the beginning of Spirituality coming in the very near future, it becomes essential that we be able to fully embrace these incoming energies. The Adam Kadmon Activation does just this. It fully ignites our DNA so that we can hold the Light that is pouring in from the Celestial Realms to change us completely! The gifts that this activation opens for us are many. We are literally becoming Superhuman! We will know ourselves as we were in the beginning – God’s creation of humans in the glory and perfection of the Divine Image – the original Blueprint! Living more comfortably in a ‘Now’ time frame instead of Linear. This means having the possibility of living 10 lifetimes in one! Having Increased consciousness awareness. This results in having much more of your brain power engaged. It also results in functioning and living in a true reality instead of a sub-reality. Experiencing a great increase in your Telepathic abilities so that you have total global contact with all humans and control of the collective consciousness. 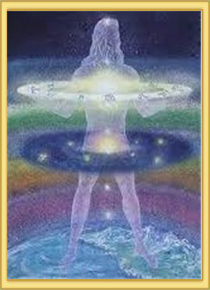 Embracing the Adamic Seed, fulfilling the prophecies and becoming a Galactic Human. Having the Gates of Heaven always open. This brings you into full contact with God and the Hierarchy of Light. Through these connections, you are able to clearly receive your guidance, support, assistance and directives for the work to be done each day. Having the Full DNA Activation. This is the completion of your full Light Body Activation with all 24 parts of your DNA Tree fired up! Having full control of the Four Elements of Earth, Water, Air and Fire. This results in the ability to manifest everything you want to bring into existence in this physical life! Having full control over the three vehicles of humans, i.e. Physical Body, Soul and Spirit. This enables us to unify these bodies and complete “The Great Work” on earth! Having spiritual and physical abundance. This results in a total understanding of Religion and Philosophy as it is practiced in the new energy of Light! Having a deeper knowledge of the “I AM” and of one’s purpose here on Earth! Cost - $50.00 Done in person. Cut those negative emotional ties and feel immediate peace and freedom.